Although the oldest traditions of Greece call for lamb, goat, or pork at the holidays, all roasted meats and poultry are commonly served. This stuffed turkey (or capon) has become a favorite with modern-day Greek cooks. Clean the bird, drain, and sprinkle with salt and pepper inside and out. Wash the giblets carefully, drain, and chop into small chunks. Preheat the oven to 450F (232C). Sauté the onion in 3 tablespoons of olive oil until soft, not browned. Add the chopped giblets and ground meat, and continue to stir until the meat is lightly browned. Add the salt, pepper, bay leaf, tomatoes, wine, and water and stir until mixed. Cover and simmer for 20-25 minutes until most of the liquid has been absorbed. 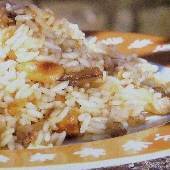 Stir in the pine nuts, boiled rice, and chestnuts and remove from heat. Stuff and tie the bird. Oil the outside using the remaining olive oil. 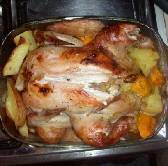 Place in a roasting pan (lined with foil or not) or on a rack in the roasting pan, and cover. Reduce heat to 350F (175C) and cook for 3.5 hours (depending on the weight), basting every 45-60 minutes with pan juices. 20 minutes before cooking time is up, uncover and allow to brown. To test with a food thermometer, internal temperature between thigh and body should reach 190F (88C). Greek cooks serve this with the stuffing inside; however, it can be spooned out into a serving bowl. Note: For a bird this size, I prefer using a capon. It’s juicier and cooks to tender perfection at this heat. I also do not use a rack in the pan, but that’s a matter of preference.